Cool-Therm is introducing a new range of high-tech, high efficiency air handling units in the UK following an agreement with Austrian company Clima Tech. The manufacturer, established 35 years ago, is well-known in mainland Europe and has a manufacturing plant near Trieste. The Clima Tech range joins Cool-Therm’s growing stable of high efficiency hvacr equipment, and complements its award-winning Turbomiser chiller to offer a complete chilled water and air handling solution. Cool-Therm will offer both standard and bespoke systems, with the emphasis on high quality and premium performance, for use in applications such as hospitals, leisure centres, commercial buildings and retail developments. Energy recovery is a key option, significantly boosting overall building energy performance and further reducing running costs. The Clima Tech system uses a rotating energy recovery wheel made of an air-permeable aluminium matrix with a very large interior surface. Designed to recover either sensible heat only or both sensible and latent heat, the wheel consists of two half moon sections installed in a double-deck or side-by-side configuration, with supply air flowing through one half while warmed exhaust air flows in counter-flow through the other, as the wheel rotates continuously at low speed. Sensible heat is recovered from the exhaust air stream through direct energy transfer to the metallic substrate, which then transfers it to the cooler supply air stream. Latent heat is captured through the use of a hygroscopic coating on the wheel, which condenses moisture from the air and transfers it, along with absorbed energy, to the lower humidity airflow. Selection software optimises the selection of the energy wheel to achieve the specified indoor conditions. Heat wheels are ideal for applications that demand a high percentage of fresh air intake such in hospitals, laboratories, universities and pharmaceutical applications. There are some 17 standard sizes of ahu with capacities up to 120,000 cu m/hr cooling and 210,000 cu m/hr heating and ventilation only. Based on a modular construction design, the units combine sequences of encased modules assembled with a range of panels sizes (30mm, 50mm and 100mm). 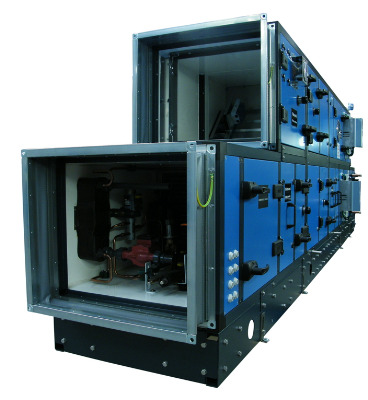 They provide the full range of air treatment options, including circulating, filtering, heating, cooling, humidifying, dehumidifying and mixing.The Clima Tech TW-series is made from framed modules manufactured from galvanized steel profiles, joined by means of 3D injection moulded and reinforced PE corners - to form a Penta-post construction. This gives the units outstanding rigidity and design flexibility. The frame construction makes it possible to disassemble and reassemble units so that they can be installed on new sites or replacement projects where access is difficult.